Overdrives are perhaps the hardest part of the whole tone building. You really need to find one that both sounds great to your ears and one that fits your rig. 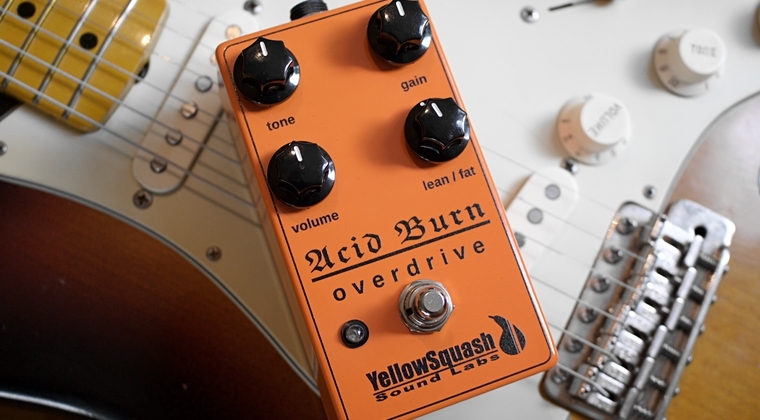 The Acid Burn Overdrive from YellowSquash promise to be a versatile alternative, suitable for a wide range of guitars and amps. Hereâ€™s my review. As we discussed in the â€œKnowing which pedals to choose for your ampâ€ feature, different amps require different pedals. An uncompressed, scooped Fender Twin often sound better with mids boosted and compressed pedals. On the other hand, a Marshall or Hiwatt might be easier to set up, with a wider range of pedals, although they often sound better with less compressed and slightly more scooped ones. The Acid Burn might not be your typical Gilmour pedal. The name alone, might frighten off some players. I did a review of their Iron Fist compressor a while back and itâ€™s truly one of the best compressors Iâ€™ve played. Naturally, I was eager to try their new overdrive. The Acid Burn is housed in a MXR-ish box, nicely powder coated, with controls for tone, gain and volume. A fourth control, labeled â€œlean/fatâ€, allows you to fine tune that EQ stage. The pedal feature a bright led, 9V battery or Boss-style adapter powering and true bypass switching. Paired with a clean amp and single coils, the Acid Burn cleans up nicely when you roll back the guitar volume. It is bright, and perhaps a tad too bright for some delicate ears, but the powerful tone control lets you roll off some of that top end, without compromising the attack and presence. This can be further adjusted by adding some low boost and top cut, with the lean/fat control. As you can hear on the review clip, the Acid Burn has a nice chime and bite with single coils. It has no problem cutting through and the attack and dynamics are very impressive. It responds incredibly well to your playing and letâ€™s you alternate your picking for less or more gain. With humbuckers, the Acid Burn gets more of that amp-like growl. Again, the lean/fat control makes the pedal very versatile and a bit of low end cut makes a huge difference, bringing out more of that top end presence. Naturally, with higher output pickups, youâ€™ll lose some of the headroom but with the gain set low, you can get some really nice boost even with humbuckers. So, where does that puts us amp-wise? The Acid Burn sounds great on all the amps I tried and although it did quite well with the scooped Fender, it did sound better on amps with more compression and mids. As I said, the Acid Burn might not be your typical Gilmour pedal but as you can hear from the review clip, it does those late 70s overdrive tones perfectly. A Powerbooster can be a challenge on smaller amps and bedroom setups and the Acid Burn is an excellent choice for similar tones but a bit more compression and mids. I really donâ€™t have any major concerns here. The Acid Burn, like the Iron Fist, is extremely quiet and it works well in combinations with other pedals. Both alone and as a booster. Personally I prefer a tone control that doesnâ€™t just open up everything past noon but rather adds a tad more compression. The gain also gets slightly fizzy if you turn it up all the way but thatâ€™s pretty much the nature of most overdrives with this wide gain range. It always cool to play a pedal that doesnâ€™t sound like a thousand others. The Acid Burn is capable of a wide range of tones and, as mentioned, it works especially well on smaller amps and bedroom setups for those classic, transparent overdrive tones. What are using for modulation in the DOGS clip? The lead tone is just the pedal. There is a Mistress flanger used on the rhythm track. Bjorn, this is a general question, and maybe an interesting one for a separate post, but you bring up the point that choosing the “right” overdrive for the “right” rig takes some effort – lots of trial and error to get a good fit. How do you think about how many overdrive pedals to keep in your collection, or how many pedals in general for that matter? Do you stay disciplined and try to limit the number of pedals to the minimum required to get all the tones you need, or does the collection continue to grow as we get more specific tools available? Do you set a hard number, etc? Hi Gene, sorry for my very late reply. Interesting question… I think that what’s important is that you design or arrange a board that cover all your needs and, that you have realistic needs. A huge board looks cool but it doesn’t really matter how many pedals you got, if you don’t use them all or if you don’t know how to use them. What I try to tell people is that they should know their gear and its potential. That will enable you to focus on the playing and probably be more creative as well. Back in the days, guitarists had only a handful of pedals but they knew how to get a wide range of tones. In terms of covering Gilmour’s tone, I think you should at least have one distortion and one overdrive. But, limiting the setup to a number can also prevent you from being creative or from getting the tones you really need. I mainly use one overdrive for pretty much everything and I have two or three differently voiced boosters or overdrives that I blend with that main pedal for different sounds. That works for me. Sorry it’s a bit off topic. In this thread, I just saw someone made a comment about boosting a tube driver. I thought I let you know that I tried my Vick Audio Overdriver as a boost upstream of Butler Real Tube Overdrive and it opened up the tone more suitable to get a good definition from the neck pickup. I found out that although my bridge pickup (SSL5) almost always sound without chocking going through the Tube Driver at OD settings using my fairly mid-heavy and fairly compressed Laney Cub, the neck pickup tends to have a bit of that tendency so I crank up the volume of the Tube Driver to get more openness but using the boost upstream of the tube driver gives sort of the same openness and good expressive mid-range definition (running Vick Audio Overdriver at 40 percent gain and medium treble and bass) and 50 percent volume. I like the fact that boosting that tube driver sounds good (manageable with tone pots) rather than some pedals if boosted, accentuate certain frequencies a bit too much and you can’t get rid of it with a simple tone knob. For instance I love the tone of the Plexidrive if used at low settings with the low input signal (even if overdriven input signal) but when the input signal is cranked up (e.g. down stream of the Tube Driver or Overdriver), it tends to peak high-mid (2k-ish) frequency a bit too much and basically it changes the tonal character of the upstream pedal a bit too much. I think generally each pedal characteristic should be looked at and reviewed and rated with all distinct different scenarios of low gain settings, high gain settings, and if being pushed with another pedal upstream (or pushing another pedal or amp downstream). This way we have a good idea of the pedal role in different parts of the signal chain, and we can move a pedal upstream or downstream of another pedal and get a particular tonal characteristic and we find out at what scenario it may sound better with neck or bridge pickup. That high peak of 2k frequency when a pedal is pushing an amp or another pedal is perhaps not very pleasant when using a mid-peaky bridge SSL5 but it will help create more definition using the neck pickup. With mild overdrive or clean tone, this is probably not an issue but higher the overall gain is, this accentuation of certain frequencies and the compression as a result of pedals stacked up can create a tone that is not very pleasant or not enough defined enough. I guess if I had a different amp with a lot of mid-range and compression and dark sounding (perhaps like hi-watt), I could make the unpleasant overtones blend in through it and still sound nice and smooth, and well defined. What do you think? Can you compare a tone you are getting with let’s say your Laney Cub vs. your Reeves? NICE REVIEW, can you please review more “normal budget” pedal, not boutique cost 200ish dollars one ? Thanks! I’ll try to do more reviews within all price ranges. In Bjorn’s defense, he has done Mooer and recently the Skreddy Rust Rod which is budget friendly. He has also done Vick Audio, and they have the lowest cost to great quality ratio around. Really a bang for your buck right there. Although we could probably use more of the bigger company names, (ie: Boss, MXR, and EHX), they generally don’t send pedals to Bjorn and he would have to pay for all those pedals on his own. Regarding budge cost, please note that I do not make or intend any offense here. I live in Canada and hence our dollar is so low compare to USD or Euro, Vick Audio cost me 200$ after tax and shipping, Skreddy is 250ish. So I mean, budget friendly is more like we can find “used” easily anywhere and still sound decent enough. Also Bjorn, can you please share your pedal board pic sometime or if you did can you send me the link ? Can you please recommend 4 or 5 pedals essential to have good tone for Pink Floyd music, not looking for exact Gilmour tone but good enough to jam with the band or do some open mic ? Thanks and please continue the good work, I’m your fan !! As I talked about in the “State of the stomp” feature, budget pedals have come a long way during the last 5-6 years and there’s no reason why can’t be a guitarist on a very tight budget and get great tones. Mooer is a great example of a company making great sounding budget friendly clones of well known and popular boutique and hard to find classic pedals. I’ll try to do more reviews of pedals like these but they’re also mentioned in the Buyer’s Guide section. It’s hard to recommend 4-5 specific pedals but I think a good start would be to get one overdrive, distortion and delay. Those three pedals will get you far. Also for David’s tones. You might also want a modulation of some sort, like a phaser or flanger and, obviously, a tuner. Again, check out the Buyer’s Guide and the Overdrive and Distortion guide in particular, for some tips on choosing versatile pedals for your setup. Cheers! Bjorn, you mentioned the Mooer Flex Boost in the muff tutorial. Which would you say is closer to a Powerboost, The Acid Burn or the Flex Boost? Looking for something distinct from my tube driver to get that 70s era sound. The Flex is a clone of the Xoric AC Booster, which is similar to the Powerbooster, with perhaps a bit more headroom. The Acid has considerably more gain and mid range, so if you want a Powerbooster-ish pedal for boosting, then the Flex is better. For high gain Powerbooster tones, the Acid is well worth checking out. Hello Bjorn! You can tell if it is similar to the BB Preamp (from Xotic) sound? Not really. The BB has dedicated bass and treble controls. This one’s got a tone control and a boost/cut feature. Toneally, the Acid has more compression and mids. Awesome! Thanks so much Bjorn. I really like its high mid freq tone and character compared to Vick Audio Overdriver. It sounds a bit thin though unless you dialed it like that to get more expression from high mid. I’m wondering if post EQ will make up for it. But what a great character for 70s DG tone! Cheers! Thank you Bjorn your reviews are always informative and enjoyable.